I HAVE OILY SKIN . . . SO WHAT?!? 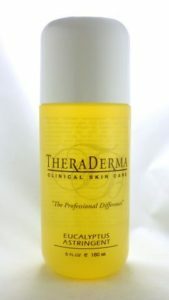 With over 30 years of skincare research, THERADERMA works with the best of Mother Nature and Science to bring you exceptional quality at an affordable price. Nowhere is this quality more evident than in its carefully calibrated system for oily skin. If you’re like most people with oily skin, you’ve not only tried a slew of different products … but also a medication or two … plus hormones … and sun lamps … and sheer elbow grease as you scrub with harsh soaps that leave your skin irritated and ultimately oiler than ever. Give your skin a break! The most important thing to remember about oily skin is this: DRYING IT OUT MAKES IT MORE OILY! WHY? BECAUSE IT STIMULATES THE OIL GLANDS AND MAKES THEM OVER-PRODUCE. 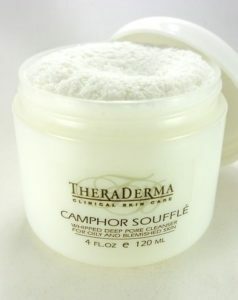 More than just a cleanser to remove make-up, Camphor Souffle Cleanser lifts oil, dead skin cells and bacteria without dying out your skin and stimulating oil glands. Aloe Vera Gel makes it gentle enough even for acne, and Camphor, Clove oil and five different herbal extracts – Ivy, Watercress, Lime Tree, Lavender and Soap Wort – make this a thorough cleanser. One deep breath and you’ll feel the medicinal and healing properties of natural eucalyptus! Removes the last traces of make up or oil and completes the cleansing process. Aloe Vera Gel and Camphor help make this effective but not harsh. Choose between . . . 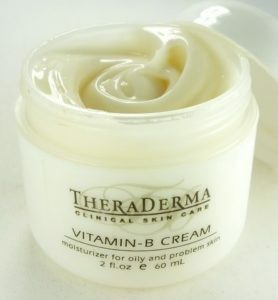 Maintain the proper balance as you control oil yet still moisturize your skin. Contains Aloe Very gel and Allantoin to soothe and heal, with fruit extracts – Blackcurrent, Tamarind and Apple – to nourish, balance and control bacteria. 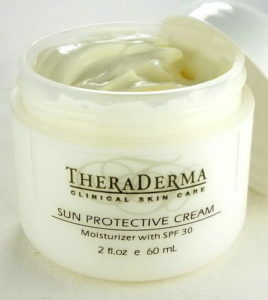 Protect against UVA and UVB rays while lightly moisturizing your skin. With Green Tea Extract and Cocoa Butter. Use once a week to exfoliate dead skin cells and smooth texture. Once again, Aloe Vera Gel ensures gentleness, while extracts of Lavender, Sage and Horsetail soothe and cleanse. YOUR OILY SKIN WORRIES SLI-I-I-IDE AWAY!! 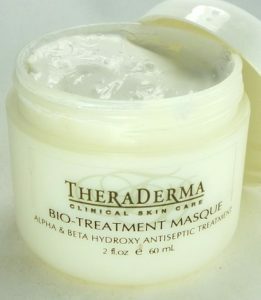 This entry was posted in acne, Cleansing oily-acne skin, Exfoliating mask, exfolite, facial cleanser, Mask, Moisturize, moisturizer, Night cream, Nourish, oily skin, Oily-Acne skin, rejuvenating mask, Skin Care, toner and tagged Acne, aloe vera gel, anti aging, dark spots, dead skin cells, exfoliate, fine lines, hyperpigmentation, oily skin, wrinkles on February 11, 2018 by admin.